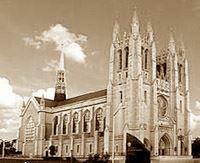 The Cathedral of the Most Blessed Sacrament is located at the east end of the Boston-Edison historic district, on Woodward Avenue and Boston Boulevard within the Arden Park - East Boston Historic District. In 1905, Detroit Bishop John Foley authorized the establishment of the Most Blessed Sacrament parish, to serve the Catholic community living just north of what were then Detroit's city limits at Grand Boulevard. However, it wasn't until 1913 that construction began on the beautiful new Neo-Gothic church on Woodward Avenue. Architect Henry A. Walsh of Cleveland, Ohio oversaw the project, and in 1915 the cruciform Norman Gothic exterior of Ohio sandstone and Indiana limestone (minus its twin spires) was completed. The interior, however still remained uncompleted. Work on Blessed Sacrament's interior proceeded slowly, as funds permitted. Finally, on Thanksgiving Day 1930, Bishop Michael Gallagher dedicated the finished interior. Although plans for the cathedral's twin spires had been on created by Henry Walsh, the Great Depression and World War II prevented construction until 1950. Detroit architect George Diehl was contracted to finish the spires and enlarge the cathedral's interior spaces. Diehl stayed true to Walsh's original plans and made certain the result would be a unified, harmonious structure. Today, the Cathedral of the Most Blessed Sacrament is one of the more impressive churches in the city of Detroit. The façade on Woodward is symmetrical, with the traditional rose window overhead and a parapet screen with life sized statues of saints. The spires flanking the entrance are flat roofed towers with four tall pointed pinnacles. Along each side of the church are five bays separated by buttresses; within each bay there is a massive Gothic window. Professional opinion says the cathedral is most impressive if viewed from Boston-Edison, on the south-east corner of West Boston Boulevard and Woodward in the mid to late afternoon.